Chicken thighs are affordable, flavorful and moist. While you can fry or grill chicken thighs, roasting them at a high temperature is a relatively quick, light, and delicious preparation option. Keep them simple or opt for a flavorful marinade. Serve roast chicken thighs with your favorite side dishes or shred the meat for tacos, soups or casseroles. You can even roast potatoes and vegetables along with the chicken for a one-dish meal your family will adore. 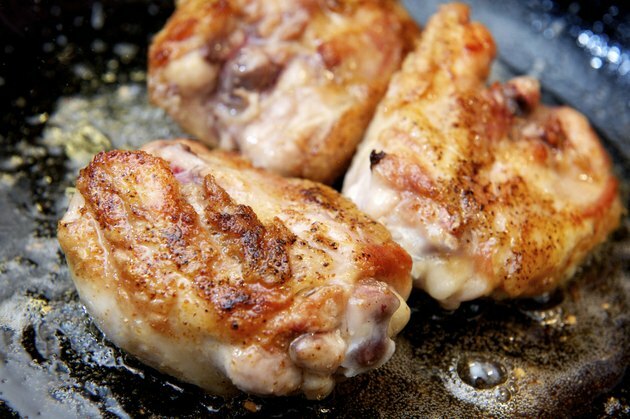 Remove the chicken thighs from the refrigerator and pat dry with paper towels. Season each chicken thigh generously with salt and pepper. Place the chicken thighs, skin side up, on a rimmed baking sheet or half sheet pan. Brush the chicken with olive oil or your favorite oil based sauce. Try a combination of soy sauce, ginger and sesame oil, olive oil, chili powder and lime juice or butter, mustard and honey. Roast for 10 minutes in the preheated oven, then turn and baste the chicken with the sauce or olive oil. Bake for an additional 10 minutes, then turn again and baste the skin side with sauce or oil once more. Cook for 5 additional minutes. Check the temperature of your chicken with an instant-read meat thermometer. It should be 160 degrees Fahrenheit. If you'd like to add vegetables, place them around the chicken. Parboil or precook slower cooking vegetables, like potatoes.